Not really the physical act but figuring out what to pack. Am I packing for an expedition to the greater ranges; mountaineering in the Alps; multi pitch sport climbing in Europe; multi pitch trad in Wales; a two day bivi trip; ice climbing in Scandinavia; a Bushcraft walk etc., etc. Wouldn’t it be great to have 20 rucksacks packed for every eventuality? One Tigris has just made my life slightly easier by sending me their Tactical Pouch 11. The pouch is ideal to use for every trip. I can fill it up and just throw it into whichever bag, from huge 120ltr. bergan to foraging messenger bag, I am taking. So what goes in? 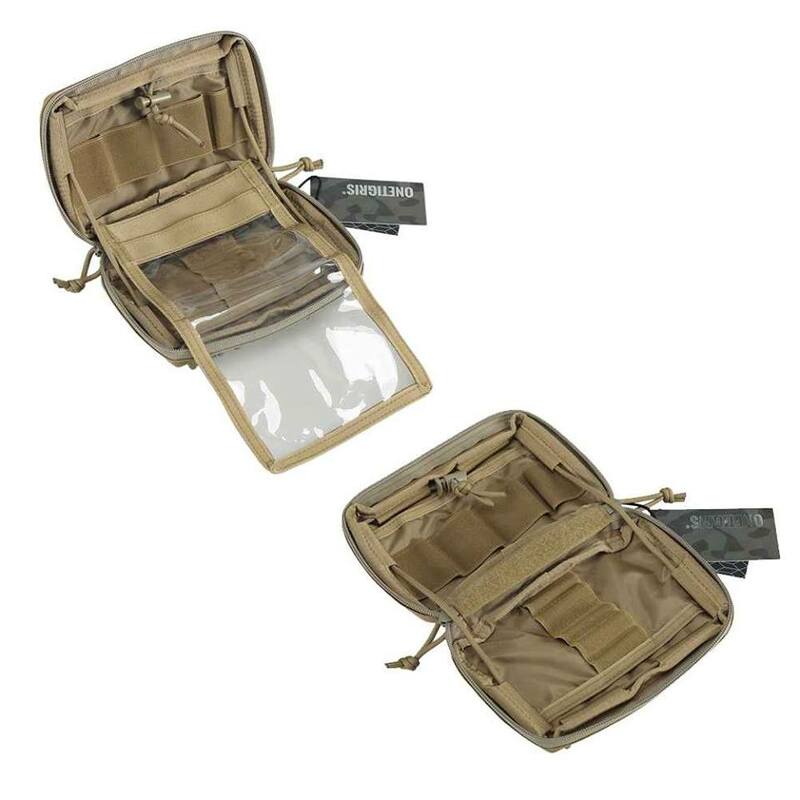 The front of the pouch is covered in Modular Lightweight Load-carrying Equipment (MOLLE) webbing made from the fluffy side of Velcro type material. On this I have my blood group patch, a morale patch and a ferrocerium rod secured to a couple of the MOLLE strips. The back also has 4 MOLLE webbing straps and I have attached another small pouch to carry ID, credit cards, money, phone etc. The pouch comes with 4 Web Dominator clips for attaching the pouch to a rucksack etc. There are two elastic loops on the base that can be used to attach something to the underside of the pouch. The pouch is closed by double zippers with pulls, so that it can be opened fully. It has paracord inside which can be adjusted to either allow for a chest mounted “desk” platform or for fully open. Of course, you can remove it if not needed. Inside I carry the following items in the many elastic loops: a mini torch, pens, pencil, personal first aid items. In one of the multi tool pockets I have a compass and various nav and slope angle cards. In the other is a multi tool, waterproof notebook and various other bits and bobs. I will keep the map holder in the pouch but will detach it and put it in my pocket when I am out. In it I will carry either a map print out or useful information I want to have easy access to. First impressions are that the pouch uses high quality materials (see below) and is constructed to the usual high standards I have come to expect from One Tigris. Check out the website. https://www.onetigris.com/?wpam_id=7 This little pouch is not only a good addition to your bag/backpack, but also a great belt mounted EDC carry pouch/dog treat pouch. So, one less thing to think about when I do my packing as I will use this pouch for every excursion. Until I get my 20 pre packed rucksacks and somewhere to store them, the Tactical Pouch 11 will be a great help. You may remember me raving about my Millican rucksack recently. Well, Fraser the rucksack is brilliant for most things we do; climbing, hill walking etc. but when I am teaching Bushcraft I am using stuff all the time, there is limited space in my pockets and taking the rucksack off every few minutes is a hassle. I would certainly suggest people on a bushcraft/wild food day carry a good shoulder bag. The best I have seen is the Millican Nick the messenger bag, which comes in two sizes – 13L and 17L. I didn’t think Nick would be quite big enough for me because as well as all the field guides, loupes, brushes, knives, saws, specimen containers etc. It is also really nice to have easy access to water (or coffee), snacks and all the other things one needs in the great outdoors. On top of all that I wanted a secure way to carry a laptop to show additional information including photos and videos. Millican came to the rescue with Stewart the Courier Bag 22L. As with Fraser the quality and attention to detail is fantastic and again it is made from sustainable materials (100% organic cotton canvas outer (weatherproofed), 100% organic cotton lining) and no plastic. The bag is festooned with pockets so access to everything I need is simple. It is a great piece of kit. I have only one complaint, although my laptop does fit in the main compartment, it does not fit in the laptop sleeve. And I do not want my computer rattling around with all the lumps of metal in the main compartment. I have decided to leave the laptop behind and I will probably get hold of Nick the messenger bag 17L. Fantastic time in Dorset. I can’t bring myself to complain about the weather being too hot but it certainly affected some of the group. Luckily, just before we left, our hats arrived. Sunstroke averted. I bought a Tarp Hat http://tarphat.co.uk/ a couple of months ago and I love it. For me they exemplify what Craggers stand for. The hats are made from recycled material – please read about them on the website – and the company donates part of its profits to a water project in Brazil. I thought I would contact them and see if we could set up some kind of deal. The response from Charlie and Ana was brilliant. They were really friendly and offered to provide wide brim Tarp Hats for our instructors, trustees and volunteers. They have also offered a great deal for members and also visitors to this site can get a 10% discount by using discount code “CRAGGERS”. 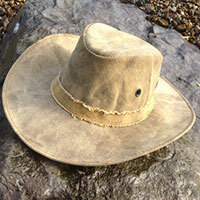 The hats are highly recommended, so visit their website and Facebook page. On Friday, at one of the climbing venues (Dancing Ledge) there is a sea filled pool hewn out of the rock and several people had a dip. Although the focus was climbing I managed to fit in a few Bushcraft sessions as well, including: Spoon carving, making paracord bracelets and identifying 20 edible and medicinal plants. We were joined by my second oldest son for a few of the days. It was a joy having him working along side me as an instructor.